THE CONSTANT COMMONER: Rounds, Rounds, Get A Rounds, I Get A Rounds . . . Or Maybe I Should Make That "South Dakota Dreamin' "
Rounds, Rounds, Get A Rounds, I Get A Rounds . . . Or Maybe I Should Make That "South Dakota Dreamin' "
Did Former Governor and present U.S. Senatorial candidate Mike Rounds reprise his vanishing act? Did he find a new place where the voters are hip or is he safe and warm in L.A? The frustrations of trying to pin the man down were only aggravated this morning when South Dakota's Department of Legislative Audit completed it's look-see of the books of the Governor's Office of Economic Development covering the period of June, 2009 through June, 2013. The results were released yesterday. 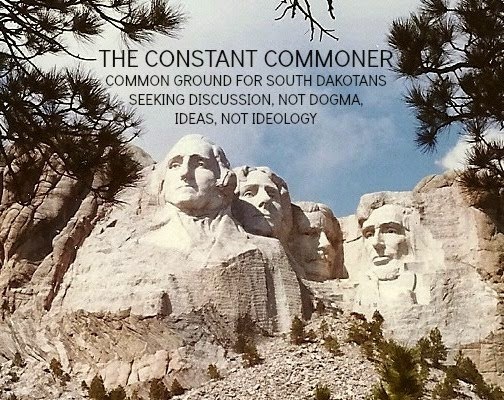 They cover a period overlapping the administrations of Rounds and his successor and current governor Dennis Daugaard. Daugaard, who's up for re-election in November will have to come out and respond to the documents findings, posthaste. In fairness to him, he inherited the GOED that was overseen for eight years by his predecessor Rounds. How Rounds will deal with the report's conclusions is my interest here . Spending a few days in relative seclusion might be necessary as he develops an official reaction to this negative critique of his GOED's operations. Considering that Rounds was Governor during the last two years of the report's coverage and six years prior to the period, I think it's fair to say that the troubles delineated by the auditors are issues that either developed during the Rounds administration or were allowed to fester, overlooked, if not totally ignored. The report was submitted by Auditor General Martin Guindon, and it yielded some quirky and troublesome findings. It said "policies and procedures were inadequate for the monitoring of the contract with SRDC." SRDC is the company that was involved with the "Slaughterhouse EB-5" fiasco in Aberdeen, costing South Dakota taxpayers millions of dollars that were provided to the enterprise via the Governor's Office of Economic Development. The whole matter is still under investigation by federal authorities. Another finding: GOED "did not have a formal written policy and related procedures addressing ethics and potential conflicts of interest." Apparently there was nothing specific to GOED employees regarding ethics and conflicts, just the one-size-fits-all handbook that is issued to all state employees. A third finding is where the quirkiness resides: "Internal controls were inadequate over the processing of travel vouchers resulting in duplicate and unsupported travel payments." Troublesome? Of course. Quirky? More than that. It's just plain weird. Here's why: "We also noted six invoices included for reimbursement in the travel vouchers that were identified as having been for translation services. These services involved having legal documents and seminar documents associated with the EB 5 program translated into other languages. All six invoices indicated that the payment on the invoice was to be made in cash. Five of the payments totaling $13,500.00 were associated with invoices from an individual that had handwritten on them “only invoice available” and the instruction on the invoice was to “pay by cash when next trip”. One invoice for $1,200.00 was on the letterhead of a Philippine hotel and had handwritten on it four names, “USD Cash $1,200.00”, “translation and interpretation”, and "only invoice available”. No receipts were included with the travel vouchers to support that payment was tendered for the services provided on the invoices. As a result, $14,700.00 in expenditures paid from the General Fund was not properly supported." The travel vouchers in question were submitted by Richard Benda for travels to Asia to gather up investors for Slaughterhouse EB-5, and these translation service vouchers were presumably payments made during a trip to the Phillipines. The "pay by cash" aspect lends some mystery to the proceedings that I believe has yet to be cleared up. So . . . we have indadequate policies and procedures, we have no written policy regarding ethics and conflicts of interest, and we have inadequate internal controls. Governor Rounds, would it be too much to ask of you to come forward and explain how this culture of incompetence and inadequacy was cultivated during your tenure as Governor? And while somebody's at it, how on earth did South Dakota get into a situation where it had to pay cash to unnamed nationals in order to get business done in the Philippines? Will the weirdness over this thing ever stop? Very insightful. It is very interesting and somewhat hard to believe that Benda, who was a career public servant, would have engaged in all of this without at least the tacit approval of his superior(s) as well as the (likely) encouragement of others associated with this program. In fact, it has been my experience that most otherwise honest people will succumb to the temptation to engage in these behaviors when placed into an environment in which corruption is practiced by everyone around them, especially their superior(s). So the ultimate question for Mr. Rounds is: What did he know and when did he know it? And it has not been a defense for decades to deliberately be an "ostrich." Thank you, Mr. Johnson. Well, so far I see a culture of incompetence and a culture of inadequacy that allowed for documented instances of corrupt behavior. It's hard for me to believe that Rounds also fostered a culture of corruption, but who knows what further investigation will bring? At this point I give the ex-Governor the benefit of the doubt. The classic question you pose remains unanswered, and I think Rounds has to address this matter. I've had my doubts up to now, but I believe his campaign will be affected. Appreciate the comments. "Unnamed recipients" -- how does the state ever disburse money to unnamed vendors? That this didn't get questioned from the get-go is beyond belief, actually. At this point I withdraw my support for Michael Rounds in the Senate race.